Watauga County Commissioner David Blust's comments about Hospitality House during county budget work sessions last week, hurtful comments that were quoted by Jesse Wood in the High Country Press, became temporarily the topic last night. Blust claims to be a devoted follower of Jesus. We feel obliged to remind Mr. Blust that Jesus would have gone to Hospitality House to break bread with those folks, something Mr. Blust certainly has not done. Once again, Blust's pharisaical attitudes are glaringly obvious. But ... crime? As speakers pointed out last night during the public hearing, there are no reports of criminal activity emanating from Hospitality House, and for an elected County Commissioner to make such a wild, unsubstantiated claim is irresponsible at best. 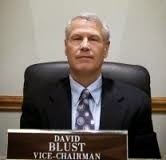 For the record, David Blust was absent from his seat during the public hearing last night. Numerous churches volunteer there Nathan....Are you mean or just stupid? There were reports for years of increased criminal activity in that area due to the methadone clinic and the nearby trailer park. So now the homeless get smeared with that same brush? Those Republicans must not be reading their Bible. Hospitality House helps those in need. The idea that those in need are freeloaders looking for handouts is appalling. The poverty rate in Watauga County is nearly 30%. That is a disgraceful record for the GOP. And using rhetoric to criminalize the poor is sinful. But those people in the GOP have no shame - or morals. But numerous churches don't ask the County to subsidize their charitable activities. Churches do exactly what charitable volunteers should do--donate their time and labor without asking for public funds to support their personal preferences. Mr Miller would prefer all those families to be on the streets? Scrounging from dumpsters, or selling their bodies perhaps? How will that impact crime rates in the county? To Cyclops, "But numerous churches don't ask the County to subsidize their charitable activities. Churches do exactly what charitable volunteers should do--donate their time and labor without asking for public funds to support their personal preferences." I don't know specifically what the Watauga County tax rules are, but Samaritan's Purse and other churches get significant tax benefits from being religious organizations. Those who donate to religious organizations also can get a tax benefit. For me, the operative argument here is that these non-profits do things very efficiently for which the county government would have to pick up the entire cost if OASIS & Hospitality House weren't there. For example, because Hospitality House requires residents to live alcohol- and drug-free, and works with those who are able to work to prepare for and find jobs, the county doesn't have to pick folks up on bitterly cold nights to stay in the jail (for a lot higher cost) so they don't freeze to death - something that happens in other places. The County doesn't have to run its own emergency shelter. We don't have the problem with panhandling that I've dealt with in other towns....the list goes on. Small amounts of support for these non-profits just makes fiscal sense to me. Go next door to the garbage company and ask their manager how many people from the HH have went in and filled out an application for employment. When they open the front door every morning it's the first place they see. Not all residents of the HH are unemployed I assume but I would guess the majority of them do not have jobs. One would think if someone really wanted to find a job why not try the first place you see or pass everyday coming and going? What the HH needs is a Job Bank where the residents could be hired for temporary work. Here is how it would operate. I would call the HH Job Bank and let them know I need 2 helpers to run weed eaters for 2 days and they will work 5-6 hours each day. I would provide the weed eaters and the fuel to run them. I would pay them $12.00 per hour. I would come by and pick the workers up in the morning and deliver them back at days end. After the two days I would then pay the job bank for both workers hours. The job bank would give the workers half of the monies earned and place the other half into an account for the worker to be saved. A worker could not turn work down and if they did more than two times they would be asked to leave the HH. Now you are putting some money in their pockets plus they have a savings account to help them get back on their own two feet in the near future.